The very lovely Jessica of The Woodland Wife did a ‘meet the maker’ feature on me for Mother’s Day… read on to learn more about Jessica and me! For me, it is, of course, a day I choose to celebrate my own wonderful mother and of course being a ‘Mummy’ myself, but in the week we celebrated ‘International Women’s Day’, I choose to celebrate ALL women, as well as the Dad’s taking on the vital role of ‘mum and dad’. The aunts who help in wonderful supporting roles in families, as well as those women who are more than happy to simply be ‘mum’ to a much-loved pet. Earlier this week, I shared my female inspirations with Thought their ‘International Women’s day 2018: who inspires our community‘ blog post. Over the course of the weekend and next week, however, another wonderful woman and talented maker Bianca and myself are giving our Instagram followers the chance to win a Personalised Initial Necklace, from what I view as her real signature collection of disc jewellery. 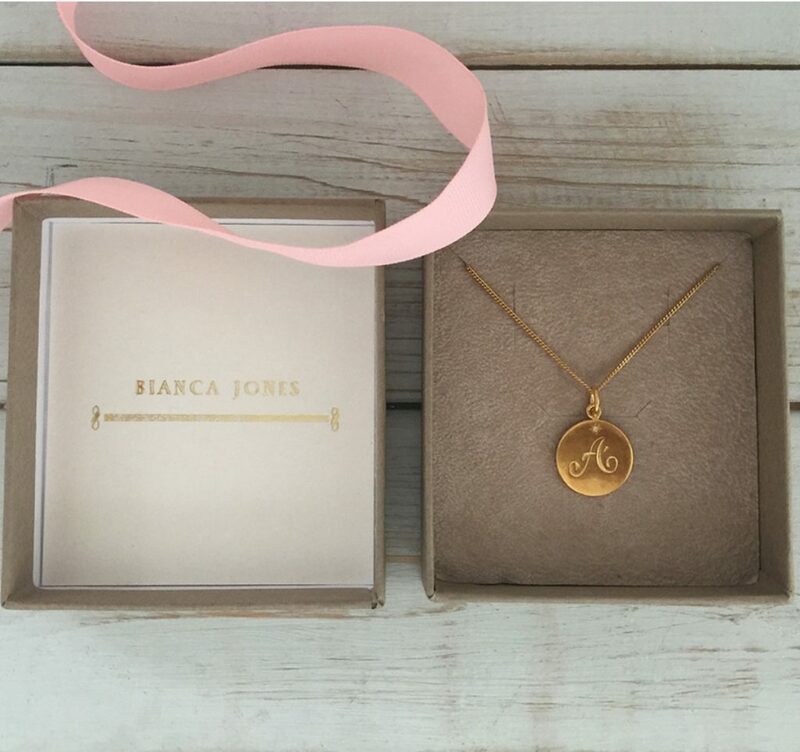 When I was introduced to Bianca and her jewellery Bianca Jones Jewellery by my sister, I instantly knew how perfect a Personalised Initial Necklace would be; since then, I have been fortunate to own an Initial Necklace with an ‘A’ for my daughter and it is worn every day. To me, this beautiful piece of jewellery represents me ‘becoming a mother’. 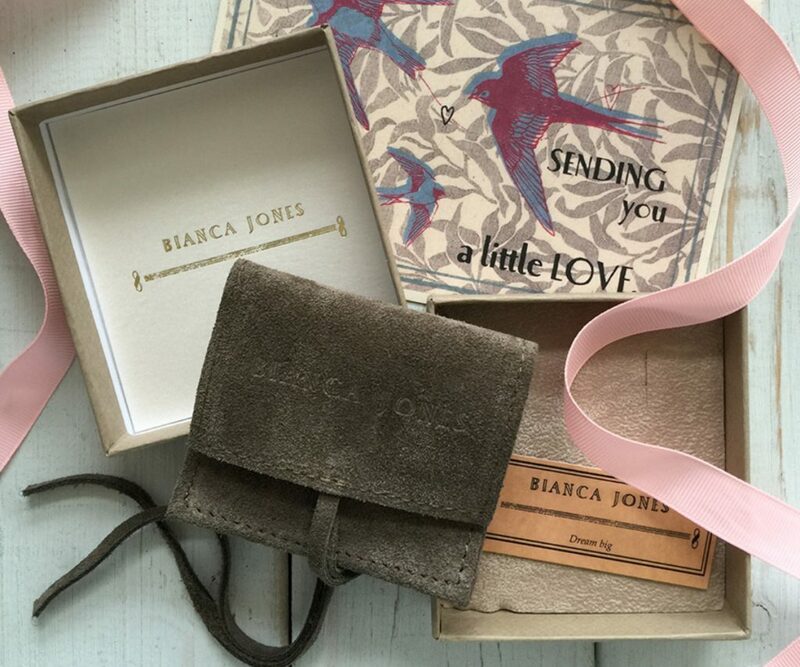 In the run-up to International Women’s Day and Mother’s Day I took some time to chat to Bianca of Bianca Jones Jewellery about the processes involved in making her jewellery, as well as the inspiration behind not just the collections, but Bianca Jones Jewellery. When I was little, my mum would drag me past all these jewellery shops to peer in the window; she had a fantastic, slightly eccentric sense of style and loved jewellery. She used to always say to me ‘I put a white light around you’ and for my sixteenth birthday, I got my first ‘proper’ Tiffany jewellery from my family. A necklace and a bracelet for each wrist, the tangible white light for me to carry with me. That was probably the moment that it clicked for me, the thought that you could create something that would symbolise the love of someone special and carry it around with you. I then went on to do a foundation course, followed by a Jewellery and Silversmithing degree at Glasgow School of Art, working in the industry before starting out on my own. WHAT IS YOUR MAIN INSPIRATION BEHIND MAKING YOUR PRODUCTS? The underlying themes of all my work are belonging and love. We have always been a very nomadic family – somehow tethering myself with symbols such as latitudes and longitudes. Coupled with the importance of carrying loved ones with you; I try and express both of these themes throughout everything I do. My degree show was a homage to this idea with every piece and materials symbolising these concepts – trying to create a version of that ‘white light’. TALK ME THROUGH THE PROCESSES? I use a multitude of processes; I sometimes draw and go straight to metal to play about with the shape to find the piece emerging. Often, I use computer-aided design for something a little more technical like my ‘Love You More’ piece, other times I will go straight into wax, carving away to find the shape I’m after. Everything, however, starts with a sketch that I then play in different mediums until I find what suits. 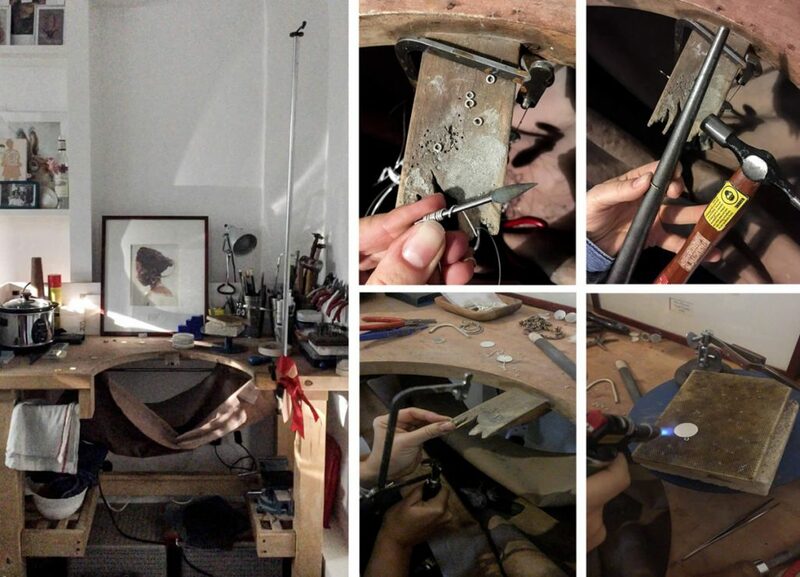 FROM INITIAL CONCEPT TO FINISHED PIECE, HOW LONG DOES IT TAKE YOU TO CREATE A PIECE FOR YOUR COLLECTION? It can take years literally! I’m probably a terrible jeweller in that I start to love things so much that it makes it hard for me to let go and put it out into the world! The ‘Comfort’ piece started about ten years ago and is based on the idea of holding hands with someone you love; that little dip in the palm of your hand. It became really emotional for me to finish and now that I have, I find it so comforting – I never take mine off. HOW IMPORTANT IS IT TO YOU THAT THE MATERIALS YOU USE ARE SUSTAINABLE AND YOU YOURSELF MAKE THE PIECES? Important on both levels; I would love my pieces to be as sustainable as possible and will continue to look for ways to achieve that. Physically making my jewellery is the only way I can see how something is going to work as it’s all about the look, feel – even the weight of something. All those elements work together making a piece successful. YOU HAVE A FABULOUS COLLECTION, RANGING FROM YOUR READY TO WEAR ‘INITIAL’ RANGE TO BESPOKE PIECES; CAN YOU TELL ME A LITTLE BIT ABOUT WHICH IS YOU FAVOURITE PIECE AND WHY? I go through phases of wearing pieces on rotation; currently, it’s a solid gold comfort necklace with a diamond – it feels so at home on my neck and is super comforting. Layered with a gold latitude & longitude of my birthplace – that feels like I’m carrying home with me. I ADORE YOUR PIECES OF JEWELLRY FOR THEIR PERSONAL TOUCH AND THE QUALITY, BUT CAN YOU TELL ME WHAT YOU THINK SETS YOU APART FROM OTHER JEWELLERY MAKERS OUT THERE? I try and make the very best work that I can and to convey the themes that I’m trying to work out for myself – the kind of universal problems. Feeling lost, needing something of home, a reminder of a loved one. I really love that I can put form to my imagination and create things that mean so much to people. ALONG WITH MY ENGAGEMENT AND WEDDING RING, THE ‘INITIAL’ NECKLACE I OWN IS TREASURED; HOW IMPORTANT IS IT TO YOU TO CREATE SOMETHING THAT WILL NOT ONLY LAST THE TEST OF TIME, BUT ALSO WILL BE HANDED DOWN THE GENERATIONS OF A FAMILY AND CREATING LASTING MEMORIES? SO important as that’s what it’s all about for me; making things that mean so much to people. I designed a family crest for a family last year, each element on that crest means something to that family. Each one of them has this beautiful, weighty, solid gold signet ring which binds them all together and tells their unique story. It doesn’t get more special than that. WHERE DO YOU HOPE TO SEE BIANCA JONES JEWELLERY IN THE FUTURE? I hope to be still making beautiful pieces that are handed down for generations to come. BIANCA’S WORKSPACE AND JUST A FEW PROCESSES INVOLVED IN MAKING AN INITIAL NECKLACE.